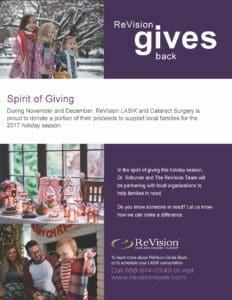 During November and December, ReVision LASIK and Cataract Surgery is proud to donate a portion of their proceeds to support local families for the 2017 holiday season. Dr. Schumer and The ReVision Team will be partnering with local organizations to help families in need. Do you know someone in need? Let us know how we can make a difference.